A commonly asked training question from clients revolves around whether to use a crate or not, so here are 11 reasons why you should crate train a dog. I know the word “should” is in the title but I don’t mean to presume to tell you this is the only way to train your dog…because it isn’t! 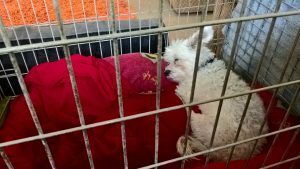 I’m taking this opportunity to talk about the positives, particularly because I know a lot of people seem to be instantly put off by the thought of “locking their puppy in a cage” – deeming it unfair and cruel. I do understand how it may appear to be the case, but there are a lot of misconceptions about crate training that I hope to dispel right here. When used properly there are many benefits, but when abused it is cruel. Imagine how a small puppy might feel when he’s brought home and has an entire house to explore!! You may be saying you live in a small apartment but even that can prove to be overwhelming. Setting up a crate to limit his access, at least in the beginning, will be a source of comfort. Because dogs are den animals, access to a small space helps make them feel safe. Dogs instinctively avoid soiling their den which is why a crate is an excellent way to housetrain your pup, teaching him bowel and bladder control. I don’t mean that literally…although I sort of do!! 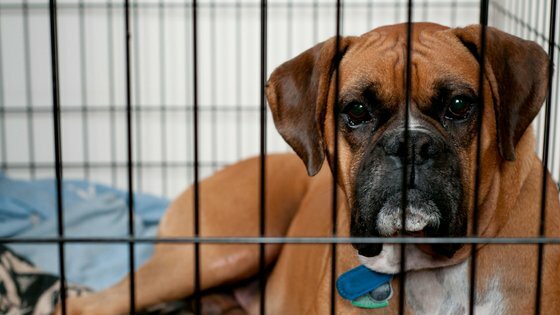 For dogs with a fear of thunder, fireworks or other really loud noises, a crate can be a sanctuary. Putting a crate cover over it can make it feel even more secure. I don’t know about you but I definitely need alone time, and so do our dogs! When trained to use a crate it can easily become a favourite place to rest and get away from it all. Until a puppy is trained he needs to be supervised so he doesn’t pee or poop in the house, chew everything in site and just generally not wreak havoc. For those times when you are unable to keep an eye on him, the crate is the next best thing, but for short periods of time not hours on end. It may seem impossible to imagine now, but at some point your dog may need a quiet place to recuperate after surgery or injury. 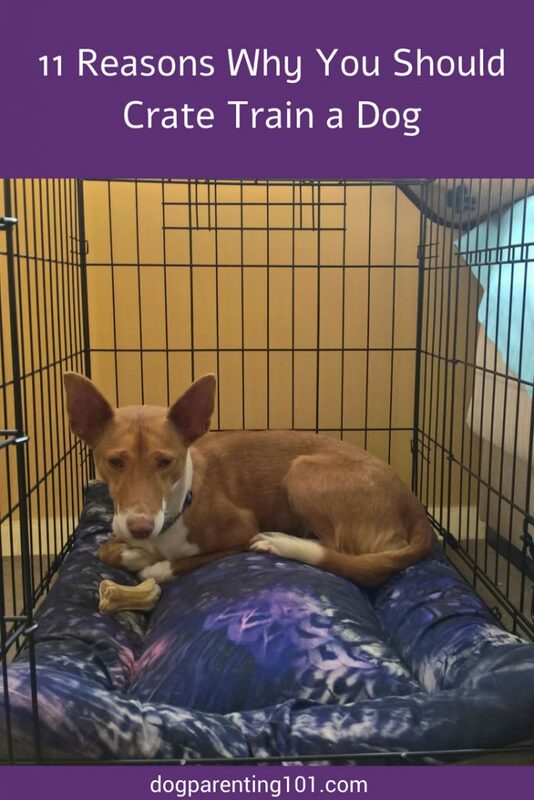 Remaining still and calm is a critical part of recovery, and a crate is the perfect place to do just that. Getting him used to one early on, will make that so much easier. If you’re traveling and will be staying in a hotel, crating your puppy, even if you’re just going downstairs for breakfast, is the safest option. If someone comes in to clean and doesn’t notice your “do not disturb” sign, there’s a risk your puppy could escape. The hotel might also be happier, knowing he can’t cause damage. I’m sure we’ve all driven with our pups on our lap, or even loose on the back seat and thankfully we’ve all arrived safely at out destinations. It’s better to start thinking in terms of “better safe than sorry” and that means putting him in a crate while in the car. It increases the chance of him surviving an accident, and he won’t be the cause of one. Of course you should include your pup on a family day out, but when it’s time to eat or he’s ready for some downtime, the crate is a perfect way to keep him safe. Be sure to put it in the shade! Whether it’s a few guests over for dinner, or your daughter’s 6th birthday with every kid invited, noise okay chaos may make your pup over excited, anxious, confused… Not only that but with the constant door opening there’s a chance your puppy can escape without anyone noticing. A crate will not only provide him with a spot away from the chaos, but it will also keep him safe in the crowd. Don’t be the person who locks the puppy in another room, the basement or even outside. He will develop behaviour problems as a result. Your puppy is part of the family and should be treated as such, so a crate in a well trafficked area of your home will do just that. I hope this post listing reasons why you should crate train a dog has been helpful, and informative. After reading this article, does it seem like it’s something you and your pup could benefit from? Leave your impressions in the comment section below.